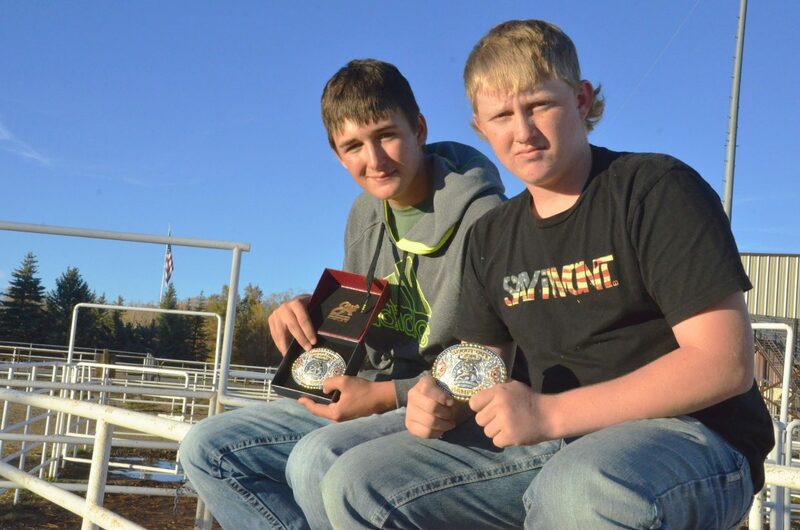 Sitting atop a fence at the Moffat County Fairgrounds arena, Moffat County High School juniors Dusty Taylor, left, and Cutter Barnes proudly display belt buckles won during the national finals of the United States Team Roping Championships in Oklahoma City. The pair split a $35,000 prize received for their sixth place finish in the Shoot-Out portion of the event. They will also be traveling to other rodeos throughout the winter. In a rodeo competition, riders in a roping event toss their lariat over an animal, tighten it up and tip their hats to the crowd. Moffat County’s Cutter Barnes and Dusty Taylor are used to this sequence, but their recent activity garnered them much more than just bragging rights. Barnes and Taylor received a total $35,000 for their sixth place finish in the finals of the United States Team Roping Championships, which took place from late October to early November in Oklahoma City. The Shoot-Out event in which they competed had a purse of $532,000, part of a larger amount of winnings of more than $5 million in the weeklong rodeo gathering. Team roping includes a header and a heeler, both with different responsibilities as they take down the animal. The pair have performed each role, but this time, Taylor was adamant that Barnes would be better as the header, who handles the steer’s horns. “The header needs a little bit bigger horse so he can pull the steer,” Taylor said. The two 16-year-olds, both juniors at Moffat County High School, have years of experience with a rope in hand and on horseback, so they had few worries about being able to tackle their steers well. What was more of a concern was the size of the crowd watching them, with hundreds more people in the stands than they’d ever seen. The grand prize at stake also had something to do with it. “Knowing there was $130,000 on the line made us a little nervous,” Barnes said. 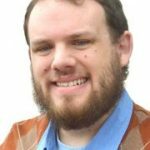 The $17,500 each of them received will be helpful in a number of ways. Besides saving for college, it will allow them to enter even more rodeo events nationwide, which could pay out even more if their performances are just right, possibly even attracting sponsorships to detract the registration costs. Furthermore, if they get scouted at these bigger rodeos, scholarships could take care of their higher education entirely. Since there is no real off-season in the rodeo world for those who want to stay involved, they’ll be traveling to Denver, Arizona and other locations throughout the winter to go for the big bucks. Once springtime rolls around and the high school team picks up again, they’ll be in prime condition. Though competing at USTRC doesn’t add to their point totals for school events, learning to cope with pressure at larger rodeos is invaluable. “At Oklahoma, that was the one where everybody’s nerves were high and your anxiety was going,” Taylor said. It was also in Oklahoma that Barnes and Taylor also got to view rodeo stars who make their living in the sport. “You get to see them walking around and roping, it’s pretty cool,” Barnes said. The other enjoyable part of the championships was that the two teenagers were able to attend with their families. Taylor also teamed with his older brother, Denton, during the events, but his round with Barnes just clicked better for some reason.